Journey for nature and flower lovers through the forested foothills of the Khan Khentii Wilderness. 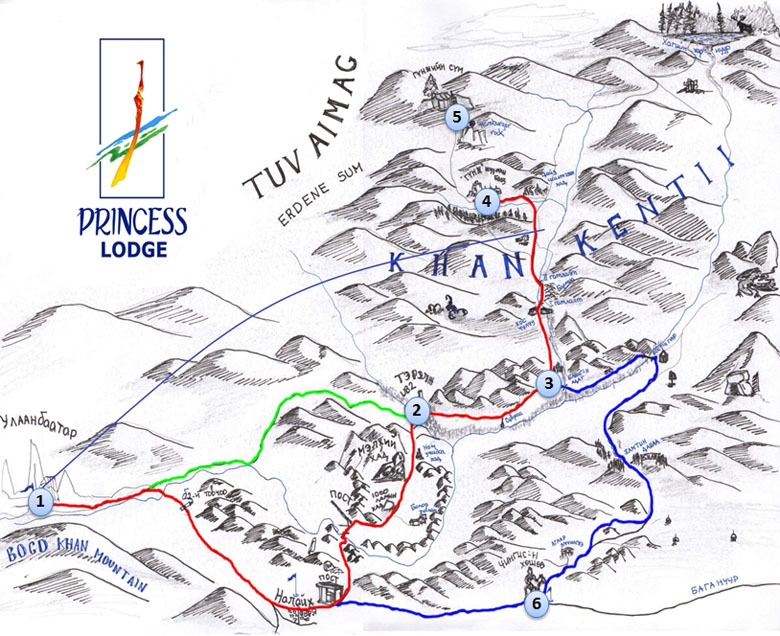 The journey is on foot starting from the Princess Lodge (PL) which lies only about 98 km from the capital of Mongolia, Ulaanbaatar. On our journey we will be driving through the Gorkhi Terelj National Park. As we trekking through this picturesque scenery it is hard to believe we are so close to Mongolia’s largest city. The tour begins from Hotel drive to Terelj National park. Start trekking at 10:00 from Terelj. The picnic lunch will be served at area of Bayan-Bulgiin Zo in the middle of grove. We cook on an open fire. After some rest we will continue our path and in the evening reach to Baruun Bayan limit and there we overnight. Here we watch and will be introduced Nomad herder’s life style and just beside, will attend to see evening milking the herd. After breakfast trekking to Princess Temple ruins, and carry on back the lunch meals which has prepared and provided and it will be served as a picnic on the way with wild nature, nature table and nature chair! After Breakfast trekking tour will march back to the Baruun Bayan limit. Lunch will be served as a picnic on the way. At the beginning point there is car waiting , then drive to Tsonjin Boldogt and sight with Great Chinggis Khaan Statue in the valley. Drive to Ulaanbaatar. Accommodation: We choose the best partners in order to attain best outcome. Every year we personally check our partner hotels and tourist camps to ensure they are maintaining the standard of service. Depending on your preference we offer various 3 to 5 star hotels and guest houses. Tourist camps are all equipped with shower and toilet, 2 to 4 PAX per Ger and restaurants. Meals: While your stay in Ulaanbaatar there are plenty of choices among Mongolian traditional, European, Indian and Asian cuisine restaurants. During your travel along the countryside tourist camps will serve with standard breakfast and meals of beef, rice and vegetables. If you are vegetarian or require Halal food we also able to organize your special need of food in Mongolia. Transport: Our vehicles are prepared to travel on Mongolian road. We use variety of air-conditioned, four wheel drive vehicles and bus. The average mileage you will drive per day in Mongolian tour is 180 to 220 kilometers. Our vehicles include Land cruiser, Delica 2, Russian Van, Bus. Guide: We arrange English, French, Russian and German speaking Mongolian guide on your Mongolian trip. Depending on the tour our special experienced guide will serve you a meal while stay in tent. Our guides always there to help you and work passionately with full of knowledge about the country and make your Mongolian travel one of your most favorite exploration around earth.